Christian Alexander Yount (born July 8, 1988) is an American football long snapper who is currently a free agent. He was signed by the Tampa Bay Buccaneers as an undrafted free agent in 2011, and has also played for the Cleveland Browns. Yount played college football for the University of California at Los Angeles (UCLA). After going unselected in the 2011 NFL Draft, Yount signed with the Tampa Bay Buccaneers. Originally, he made the roster out of training camp, but was released by the team on September 14, only to be re-signed on September 17. He was waived again on October 25. 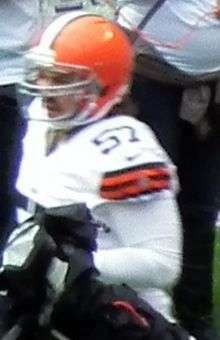 On November 29, 2011, Yount signed with the Cleveland Browns. On August 6, 2013, Yount signed a five-year contract extension. On May 29, 2015, Yount was waived. On April 22, 2016, Yount signed with the New England Patriots. Yount was released on July 21, 2016. ↑ Ulrich, Nate. "Cleveland Browns sign long snapper Christian Yount to replace Ryan Pontbriand". www.ohio.com. Retrieved 2016-04-23. ↑ "Christian Yount signs extension". ESPN.com. August 6, 2013. Retrieved 2014-07-02. ↑ "Patriots sign LB Tony Steward and LS Christian Yount". New England Patriots. Retrieved 2016-04-23. ↑ "Patriots release LB C.J. Johnson and LS Christian Yount". New England Patriots. 2016-07-21. Retrieved 2016-07-21.